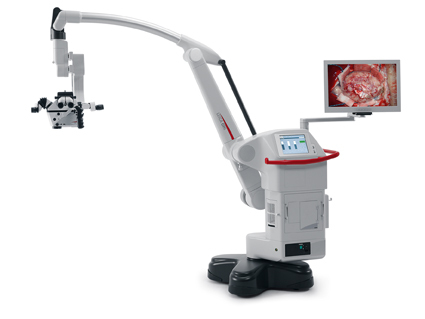 Leica Microsystems has launched a new neurosurgical microscope, the Leica M530 OH6. To enable surgeons to see better into deep, narrow cavities, it is equipped with FusionOptics technology, advanced Small Angle Illumination (SAI) and apochromatic optics. The design of the microscope enables surgeons and assistants to work in a neutral, upright posture which helps prevent strain and fatigue. The OH6 stand provides a long reach and offers a working distance of up to 600mm which leaves surgeons and assistants room to work in comfort even in spine procedures where long instruments are required. Thanks to Leica Microsystems' OpenArchitecture, and the modular yet integrated design of the Leica M530 OH6, surgeons can choose the options they need now and upgrade any time in the future. The instrument can be equipped with intraoperative fluorescence modules Leica FL400 for intraoperative tumour fluorescence or Leica FL800 for intraoperative vascular fluorescence as well as TrueVision 3D HD visualisation. FusionOptics technology developed by Leica Microsystems utillises two separate beam paths: One path provides high resolution, the other provides depth of field. The brain merges the two images into one, taking the best information from the two sources. The result is that, compared to a microscope without FusionOptics, a larger three-dimensional area is in full focus which means surgeons have to spend less time refocusing. Premium quality apochromatic optics ensure excellent image quality. The Leica M530 OH6 is outfitted with 400 Watt Xenon illumination. Together with Small Angle Illumination (SAI), light can penetrate to the bottom of deep, narrow cavities during procedures. The result: fewer shadows appear in cavities, more details are revealed, and depth perception is enhanced.